I’m now working on a new open-access journal as a key endeavour for the Collaboratory. The idea is to create a journal focusing on the history and archaeology of linear earthworks and other boundaries and frontier works. The journal will also explore the heritage conservation, management and interpretation of these monuments. The focus will be on Offa’s Dyke and Wat’s Dyke and other early medieval linear earthworks. However, there will be scope to invite and incorporate a range of studies regarding the biographies and landscape contexts of frontiers, in both the past and the present, from Britain, Europe and beyond. The aim will be to include re-prints of past key works, as well as new studies, including developments of presentations at Collaboratory events. More details will be announced soon, so watch this space! Of direct relevance to the contested frontier landscape of the pre-Norman era is the fascinating cross at Maen Achwyfan, Flintshire. It is close to the Whitford dykes and close to where Offa’s Dyke has been considered by antiquarians as running. Indeed, I just love Maen Achwyfan: a 10th/11th-century cross in Flintshire. It is actually really easy to find if you want to visit, located just north of the A55 at the Caerwys junction (Junction 31). So if you’re stopping for petrol or the cafe or Greggs or McDonald’s, why not take the 5 mins drive to see this awesome early medieval stone in its original location? The experience of the stone in fog! My TAG 2015 session at the University of Bradford which included a paper with Aurea Izquierdo Zamora about the landscape context of the monument. a 2015 TAG session on Mobility, Monumentality and Memory. In summer 2016 I spoke to the Cambrian Archaeological Association about Maen Achwyfan: this is featured in the latest Archaeologia Cambrensis. A 2016 talk on the Isle of Man about the potential commemorative significance of martial representations on early medieval stone sculpture. On Saturday morning I went to see the Early Medieval Archaeology of Wales Archaeology Research Group (EMWARG) and outlined my latest thinking about the monument, suggesting we need to think about the art of the cross in relation to its landscape context and vice versa. One of the areas I addressed was the interpretation of the figural scenes on the narrow southward face B. I proposed that it represents a martial figure with snakes attacking him from below and above. Below this I suggested were two figures facing each other: there are numerous possibilities from early medieval stone sculpture regarding their identity. Below this, was a beast and a tree, and features beneath the beast’s legs. Rather than a horse and perhaps linked to the legend of Sigurd the dragonslayer, I proposed it is actually a crude rendition of the twins Romulus and Remus suckling from the she-wolf. Similarities with the 8th-century Franks Casket require careful consideration. If accepted, this shifts the interpretation of the cross away from the ‘Viking’ world exclusively and helps us consider the art as visualising the marking and protection of church lands in relation to lay patrons. At the inaugural Collaboratory workshop in Shrewsbury in April 2017, I presented the key findings of work conducted by Dr Patricia Murrieta-Flores and myself stemming from the Past in its Place ERC-funded project. I’ve discussed various elements of this paper before on on my blog but the final publication is now out in the journal Medieval Archaeology. Placing the Pillar of Eliseg explores movement and memory through the landscape around this unique 9th-century monument, helping to explain how the monument was positioned, its possible function and its significance as a feature in a volatile and fluid ‘frontier zone’. THE LANDSCAPE CONTEXT of the early 9th–century monument known as the Pillar of Eliseg is interrogated here for the first time with GIS–based analysis and innovative spatial methodologies. Our interpretation aims to move beyond regarding the Pillar as a prominent example of early medieval monument reuse and a probable early medieval assembly site. We argue that the location and topographical context of the cross and mound facilitated the monument’s significance as an early medieval locus of power, faith and commemoration in a contested frontier zone. The specific choice of location is shown to relate to patterns of movement and visibility that may have facilitated and enhanced the ceremonial and commemorative roles of the monument. By shedding new light on the interpretation of the Pillar of Eliseg as a node of social and religious aggregation and ideological power, our study has theoretical and methodological implications for studying the landscape contexts of early medieval stone monuments. While principally about the Pillar of Eliseg, this is key to understanding Offa’s Dyke and Wat’s Dyke as successive and related linear frontier works. This is because the Pillar is the most notable surviving monument built by the rivals of the Mercians along their western frontier. Raised by Cyngen son of Cadell, it honours his great grandfather Eliseg. Moreover, our study makes a series of points regarding how the linear earthworks operated to control movement and visibility at the eastern entrance to the Vale of Llangollen. A year ago I wrote a critical post about ‘Dyke Denial at Chirk Castle‘. Despite being a fan of this wonderful National Trust property, I was disappointed by the low priority given to informing and educating visitors about Offa’s Dyke which runs through the grounds. Visitors enter by car, coach bicycle or on foot, crossing Offa’s Dyke as they near the car park. They then walk over Offa’s Dyke having got their tickets. They may stand upon the line of Offa’s Dyke in the adventure play ground beside the cafe and kids can play on Offa’s Dyke: pushing around toy tracdtors. 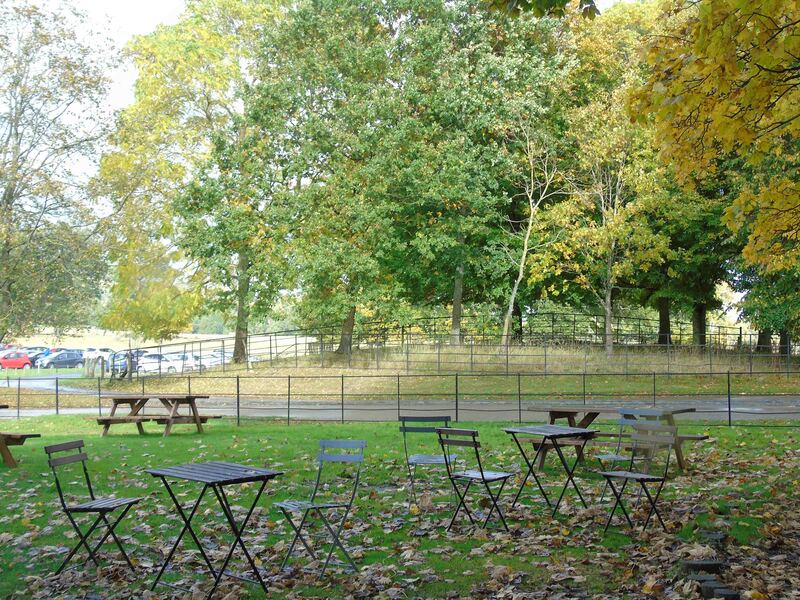 Furthermore, they can walk over the Dyke to visit the kitchen garden and picnic area. They can even walk down Offa’s Dyke via a footpath. They can do all this, and many will not even realise Offa’s Dyke is there! Likewise, Offa’s Dyke is also accessible within the wider castle grounds, even if a footpath doesn’t follow it for large sections. Yet in the castle and gardens, there is little to explain this monument. I admit the Dyke significantly denuded in the castle’s landscape setting and therefore not readily apparent. Yet some considered display boards and other information could readily be deployoed to raise awareness of this monument for visitors. Offa’s Dyke is a threatened and ill-understood monument. It was perhaps built whole or in part by the late eighth-century ruler of Mercia – Offa – as part of a complex frontier with his Welsh rivals. The line of this internationally renowned early medieval linear earthwork – unquestionably the largest and longest human-made structure from prehistoric, Roman and medieval times surviving in the British Isles – is not marked out on the ground at Chirk. There are also no dedicated heritage signs or detail in the guide book about it. Therefore, much of my critique remains valid that NT Chirk find themselves in ‘dyke denial’ – focusing instead on the medieval and post-medieval castle and its grounds in their story of the site. 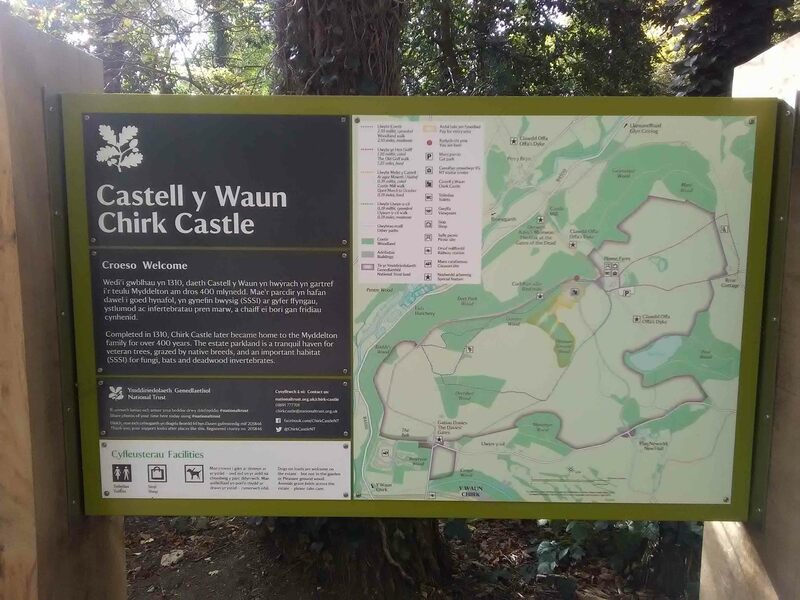 However, today I visited and noted that there were new maps of Chirk Castle and its gardens to help visitors navigate this fabulous site. Among these, there is a new map of the castle grounds on which Offa’s Dyke is now clearly shown. NT Chirk remains in ‘dyke denial’, but this is a major and helpful step forward. Finding early medieval dykes can be a hit and miss affair, I should know, I did my PhD on the things studying over a hundred examples. Sometimes I seemed to be going round and round in circles on foot or in my car fruitlessly comparing odd small lumps on the ground with antiquarian references to massive earthworks wondering if I was in the right place or chasing wild geese. While further north Offa’s Dyke is one of the easiest and most obvious to find, in Herefordshire guesswork and supposition seems the order of the day. Rather than a clear dyke, short disconnected earthworks can be found (or not depending on how well-prepared you were with your maps). One such section is Lyonshall Bank. The name is relatively recent, probably coined by Fox to distinguish this isolated earthwork which is usually called ‘Offa’s Dyke’ on early Ordnance Survey maps. There are references to ‘Row Ditch’ in tithe maps and a fourteenth century reference to a nearby meadow as Rowdiche suggesting that was the original name. It probably derives from the name Rough ditch, suggesting whoever named it was also not terribly impressed about how well this earthwork was made. The name derives from the village that lies on the northeast side of the earthwork that has seen better days. It once boasted a castle (now ruinous and in private hands), a pub (closed) and a railway station (also shut). The dyke runs northwest to southeast and is cut by a minor road. Where the route cuts the dyke is a good place to park to explore the earthwork especially in the wooded area to the north of the road where a footpath conveniently follows the bank. Many of the earthworks in Herefordshire and those in the Wye Valley exist in a limbo world of either being in or out of the Offa’s Dyke gang depending on which authority you read. Some are distinctly uninspiring looking more like glorified hedgerows that just happen to be on the right alignment, but Lyonshall Ditch is a substantial affair that looms over the car as you drive through it. It is oddly larger nearer the road than away from it. I have always been very cynical of gateways through dykes that have not been tested by excavation. Here the dyke looks like it was larger where the routeway went through it. I wonder if it did cut the road in order to prevent access and later when the dyke went out of use people reconnected the route punching a hole in the earthwork. A scramble through the woods along the bank to the north of the road there is a curved access through the dyke, perhaps this was an original entrance, but even this could have been dug by farmers either for drainage reasons or allow livestock to move between fields. Who knows. These structures seem to give up their secrets with great reluctance. All I know is the scrunch of autumn leaves under foot and the early flowering wild flowers on the sides of the bank (snowdrops if memory serves) made for a pleasant diversion for me, the kids and the dog. Here are details of the 2nd Offa’s Dyke Collaboratory event: a conference session at the 39th Theoretical Archaeology Group conference to be held on the afternoon of Tuesday 19th December at Cardiff University. To register for the conference, please follow this link: Cardiff TAG. Mark Bell: Bringing the Dykes into the 21st Century: How did we get here? This paper explores how the dykes were first brought together as a coherent group of monuments between the 1920s and the 1950s and how they fitted neatly into the prevailing ideas about environment and society. Many of the interpretations of how dykes worked in the landscape either consciously or unconsciously reflected the turmoil of the period. By the 1960s and 1970s, after a huge upheaval in our understanding of society and environment, the dykes did not fit so neatly into the new picture of post-Roman Britain. The relative neglect of the dykes in the second half of the 20th century has left the dykes stranded out on a conceptual limb. Modern writings about the dykes sometimes seem strangely old fashioned as they follow models first set in the 1950s. If the dykes are to be brought into the 21st century then then the old interpretations need to be rigorously questioned and even basic ideas such as the extent of particular dykes need to be looked at again in the light of new evidence. Despite a long history of excavation and academic research no clear date (beyond ‘post-Roman’) has been produced for the construction of the monumental phases of the four Cambridgeshire ‘Anglo-Saxon’ Dykes. However, recent work along the westernmost of these, the Bran Ditch, has dated the initial phase of construction to the Early Iron Age. Three parallel ditches, on the same alignment as the Bran Ditch, were dated to the Early Iron Age through ceramics, radiocarbon and stratigraphic/spatial relationships. Two triple-ditched alignments are already known further west, one already dated to the Middle Iron Age. These early alignments may have functioned as both territorial boundaries, crossing the Icknield/Ashwell belt, and as routeways at the edges of these territories – both long-distance and between upland and lowland pasture. Two new triple-ditch alignments have been recorded in the gaps between the monumental ‘Saxon’ Dykes, further tying them in to the Iron Age boundaries to the west. Claud Lyuarch hen (Llywarch Hen’s dyke) is named in the boundary clause of an early medieval charter contained in the twelfth century Book of Llandaff. The charter grants an estate at Llan-gors (Brycheiniog), and purports to have been made a King Awst and his sons in the early- to mid-eighth century. The place-name is a clear reference to the Llywarch Hen of Welsh poetic tradition, and a case has been made for the poems having been written at Llan-gors sometime between the eighth and tenth century (Sims- Williams 1993). The dyke can be identified on the ground as a penclawdd (head-dyke); a land boundary that separated lowland infield from the unenclosed upland pastures. Thus, whilst the dyke was a prominent feature in the landscape it is unlikely to have served as a defensive earthwork. Nevertheless, it can be argued that Llywarch Hen’s dyke was more than just a convenient feature with which to define an estate. Rather, the earthwork and the oral traditions associated with it performed a didactic role that reinforced knowledge of the physical extent of the estate and of the status and power of those who held it. The first embankments in coastal Flanders were initiated by the early Counts of Flanders (family of the dynasty of Wessex). They made the choice to embank the salt marshes, which not only marked a new perception of and strategy towards the environment, but also the emergence of impressive comital estates. These dykes where so much more than defensive functional elements against the tides, they also acted as social and political markers, through which the counts’ administration interacted with other social groups in coastal Flanders (the so called Maritimi Flandrenses). They embodied new power, and new ways of life, and were as such important symbols of early state formation by the powerful dynasty of the Counts of Flanders. As the twenty-first century plays out our need to understand borders and contested spaces continues to increase. What part can archaeology play in enhancing our understanding of these environments? How, during their apogee, do Mercian attempts to manage their western borders mirror and inform our responses to contemporary contested spaces? What of the British responses to these acts of hegemony? How do populations find a way to function in and around borders? Theoretical and methodological developments over the last three decades have revolutionised the conceptual frameworks to which archaeological researchers have access. As the fields of both landscape and border studies continue to embrace analyses with a temporal element into their mainstream archaeologists have an opportunity to draw on and contribute to wider academic debates on contested spaces. Typified by increased scholarly interest in questions relating to space and place and supported by new data sets and increasingly powerful computational toolkits, these advances promise new and fruitful avenues of enquiry. This project combines research strands born out of the interdisciplinary Spatial Turn paradigm shift, psychology, landscape and border studies to undertake an archaeological study of the long-standing contested environment of the Anglo-Welsh border in the early medieval period. Linear earthworks are about nothing if not movement through landscape; from a landscape archaeologist’s viewpoint, long earthworks and long-distance routeways have certain similarities, not least in terms of scale and ‘behaviour’. Especially where neighbouring polities were relatively large and ethnically different, ‘frontier works’ must have been related to, and complemented by, an effective system of routeways/roads and surveillance points. These issues are discussed in relation to a well-known conundrum: how do we interpret the behaviour of Offa’s Dyke in Herefordshire, where it apparently becomes ‘hyphenated’ and then disappears altogether? In this area, the Dyke’s elusive character may help us to develop insights into the nature of the early medieval ‘frontier zone’. Most research on Offa’s Dyke has focussed on the political, social and landscape contexts of the time in which it is presumed to have been built, namely the late-eighth century. However work on Offa’s Dyke – and indeed other medieval linear earthworks – has entirely ignored the increasingly well-developed theoretical perspectives in the field of contemporary border studies. Here it has been argued that borders and border monuments should be viewed less as markers of division and more as mechanisms of connectivity and encounter; borders are liminal spaces, providing means of passage and facilitating the creation of cross-border networks. Borders – whether real or imagined – create a ‘borderland’: an area which is administratively and politically connected to one polity, but which comes under strong economic, cultural and demographic influences from another. This paper looks afresh at Offa’s Dyke from these theoretical perspectives and argues that the construction of the Dyke was part of a deliberate programme to create such a ‘borderland’ landscape. In the event this did not benefit the kingdom of Mercia, but it did generate a distinctive cultural and physical landscape which influenced political and social change for the next thousand years. This paper looks beyond the period and themes that have characterised the Wall’s research tradition, and situates it within recent discourse on the afterlife of frontiers: an agenda that has been particularly pursued for Hadrian’s Wall. It is argued that traditional research artificially elides time between the present of modern investigation and the past of the Roman period, leaving the intervening post-Roman centuries comparatively unexplored and absent from academic discourse and public presentations of contemporary significance. A new diachronic framework is proposed that accommodates both traditional Roman frontier concerns and emergent themes from new investigation of the Wall’s wider biography. Now is a really exciting time to be starting a community-based project on Offa’s Dyke. The publication of Keith Ray and Ian Bapty’s (2016) long-anticipated book on the monument, the creation of the Collaboratory itself and new initiatives from a revitalised Offa’s Dyke Association (Offa’s Dyke Association) are all combining to raise the profile of the monument. Public engagement with Offa’s Dyke is diverse and comes from a range of stakeholders. Those charged with legal responsibility for the monument’s conservation and protection, academics, landowners and local businesses, those who use it as a recreational resource all have a vested interest and a voice. In many cases these voices can be heard through statutory channels, local business initiatives or through well-established lobby groups at regional and national levels. The channels for the thoughts and opinions of those who live alongside the dyke, of those community groups who are concerned with its preservation and recording, are less readily obvious. The Community Stewardship of Mercian Monuments (CoSMM) project explores how an online community-lead archaeology project developed under the auspices of the Offa’s Dyke Association (ODA) can provide such a resource, not just for Offa’s Dyke, but also for Wat’s Dyke and other examples of Early Medieval archaeology in the Welsh Marches. Such an initiative is important for a number of reasons. The latest digital technologies provide heritage professionals with the opportunity to more effectively record, research and conserve landscapes than ever before (e.g. The “Stonehenge Hidden Landscape Project,”). Nevertheless, the sheer scale of Offa’s Dyke as it runs through two countries, multiple local authority areas and innumerable settlements along its route continues to render a long-term, comprehensive, top-down approach a logistical challenge. In contrast, scalable, local programmes of recording and conservation by committed groups working to a standard framework and coming together within a single online portal promise to be both achievable and sustainable over the long-term. Crucially, and perhaps most importantly, the project also provides a voice for the local communities, individually and collectively, to create a sense of ownership of the monument and an opportunity to share their perceptions, experiences and resources. Whilst such large-scale community-based archaeology projects can be challenging a number of precedents demonstrate their value. Soininen’s (2017) account of the ‘Adopt-a-monument’ scheme in Finland provides a valuable example of an extremely successful large-scale community-lead programme, whilst McDavid’s (2009) frank accounts of her online projects based in the United States provide details of both their failures and successes and crucially a conclusion that such endeavours are ultimately worthwhile. In the case of CoSMM earliest plans are simple and scalable. The initial pilot phase is being undertaken on Offa’s Dyke by the Trefonen Rural Protection Group (TRPG) (Trefonen – Rural & Heritage) and in the first instance focuses on the development of a fixed-point photography conservation programme; the methodology is proven and based on that deployed by Dave McGlade, the current Chair of the ODA, in his work as National Trails Officer for Hadrian’s Wall (McGlade, 2015). The group’s work will be coordinated by TRPG Committee members, who will take responsibility for training and day-to-day management on the ground. Local volunteers will download pro-forma documentation and upload their photographic and tabular data to the project’s intranet site, again, coordinated by the TRPG Committee. Those who are less comfortable with web-based technologies will be able to work with paper forms. Once the local framework is in place and tested the working practices will be reviewed to establish whether they are effective and sustainable, to identify ‘pinch-points’ and where improvements can be made before more ambitious fieldwork plans are put in place. At all points the archaeologists will be available to provide help, advice and support wherever needed, but the community will own the project. Subsets of the data will be made available on the accompanying public-facing website to promote the project and the monument itself. Following the pilot, as more communities join, the value of combining these local, scalable resources will become apparent for raising the profile of Offa’s and Wat’s Dykes, for contributing to our knowledge and understanding of the monuments and for their long-term preservation. Alongside these conservation and recording activities CoSMM will explore what the monuments mean to the communities living alongside them today and to the people who visit them. That the monuments continue to hold significance is in no doubt. Aside from the most obvious National Trail that bears the name of Offa’s Dyke the countryside of the Anglo-Welsh border is littered with contemporary references to Offa ranging from, for example, a local business park, a brewery and even a distillery! The monument’s role in local mythology, entertainment, tourism and as a tool for local economic vitality is unmistakable. But alongside these tangible references are other more subtle mechanisms through which these monuments are appropriated, transformed and represented in the early twenty-first century and it is these the project is equally concerned with. In order to explore the significance and meanings attached to the dykes, the volunteers and members of the local communities, both individually and collectively, will be invited to complete an anonymised questionnaire. Attitudes towards the conservation, interpretation and meaning of the monuments will be surveyed, analysed and summarised. It is hoped that this aspect of the project will provide a means by which wider community engagement, most notably through schools, will be encouraged and facilitated. Additionally, the local representatives and volunteers will be invited to events and meetings hosted by the ODA to facilitate face-to-face discussions to supplement those made available through the project’s intranet. Finally, the questionnaires will also be made available in the Offa’s Dyke Centre at Knighton to encourage visitor participation and those willing to take a few minutes to complete the survey will be invited to sign up for regular updates on progress. The Offa’s Dyke Association is the natural home for CoSMM which is only the latest addition to its programmes dedicated to preserving and promoting the monument since its inception by the late Frank Noble in 1969. That the Association is hosting, facilitating and supporting this effort is a measure of the scale of its ambitions in promoting both Offa’s and Wat’s Dykes to locals and visitors alike and we’re very grateful for their support. Work is only just beginning, but the early signs are encouraging. Of course, we’ll be reporting on progress through the Collaboratory website, the ODA Newsletter and the website when it launches. We’re very much looking forward to seeing where the future takes us.